The Dumpsta Players | Open the Dumpsta — if you dare! 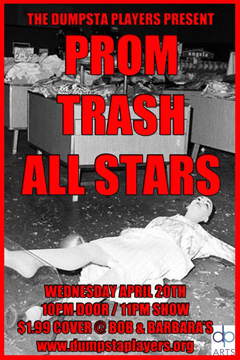 For PromTrash All-Stars, The Dumpsta Players are bringing back past winners and character favorites Needles Jones, Mrs. Miller, Amanda Playwythe, Margaret Orthodox, Dot, Divine Miss Jimmi and many more to claw to the final finish. This will be the Dumpsta Players’ final show at Bob and Barbara’s Lounge. 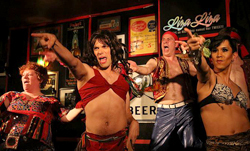 The Dumpsta Players will continue to create original content for their television show on PhillyCAM, viewable on Comcast 66 and Verizon Fios 29/30 on Tuesdays at Midnight and Sundays at 11:00pm.